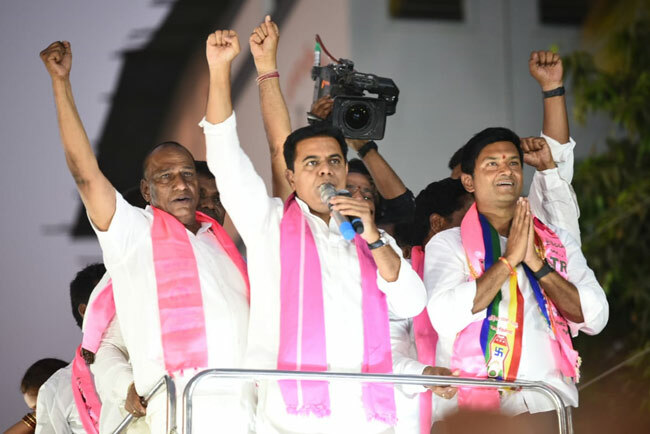 Addressing a roadshow in Malkajgiri parliament constituency, KTR stated that Telangana government planned to construct two skyways (Paradise circle to Suchitra) and (Jubilee bus station to Shamirpet). “We approached all the three Defence Ministers, (Manohar Parrikar, Arun Jaitley and Nirmala Sitharaman) but none responded,” said KTR. “We have asked 100 acres of defense land to construct two flyovers in Secunderabad. In exchange, we offered 500 acres in Shamirpet. We made multiple requests which were unanswered. The leaders at the center never gave permissions,” said KTR. KTR also stated that the defense authorities closed roads in the Cantonment area, causing inconvenience to the people. If our 16 MPs go to Parliament, people of Telangana will become the deciding factor at the centre, he stated. Talking about the development works taken up by the Telangana government in Cantonment, KTR mentioned that the TRS government gave Rs. 2.5 crores to Ramanakunta, but Cantonment board members never let the work progress. KTR said that a total of Rs. 17 crores worth water bills of the poor people were waived off by the Telangana government. He also mentioned that five Annapurna canteens were set up in Cantonment area though it was pertaining only to GHMC. KTR went on and said that the Congress candidate Revanth Reddy lost the election in Kodangal and is trying his luck in Malkajgiri. “Choose your leader wisely,” said KTR. KTR asked the people to vote for TRS in the upcoming elections.